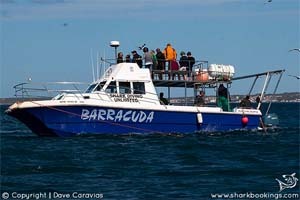 White Shark Diving Company has been around since nearly the beginning of the industry with a good track record. 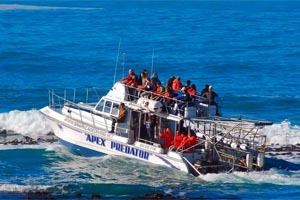 The staff and crew are well-trained with years of experience in the shark cage diving industry. 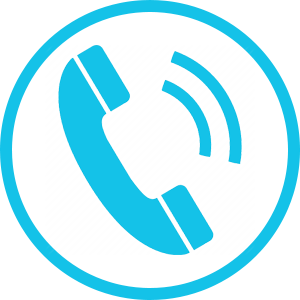 They adhere to the strict set of rules in place by the South African Government’s Department of Nature Conservation. 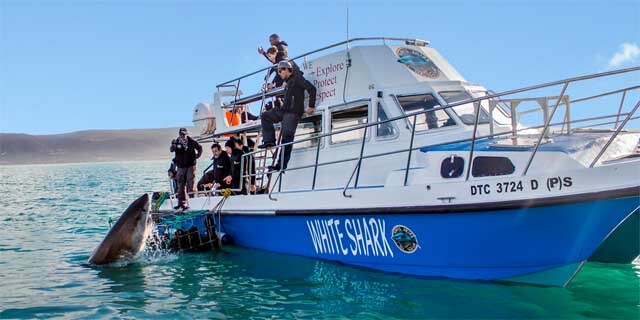 The Boat, ‘White Shark’, is a 12 meter deep sea-cabin cruiser Cat which has been custom built to the specifications required for shark cage diving. 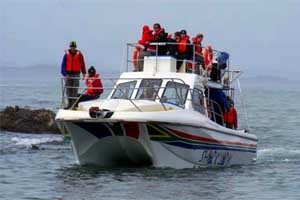 The biat has an upper floor for excellent shark viewing and the boat takes a maximum of 20 people. The engines are 2 x 4-stroke outboards which are environmentally friendly and also quiet and free from the fuel smell. 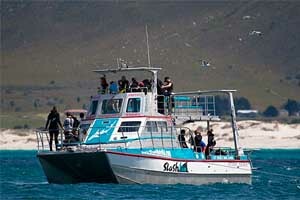 The cage is new and accommodates for 6 divers at the same time. Viewing from the cage is excellent on the surface as well as just underwater. 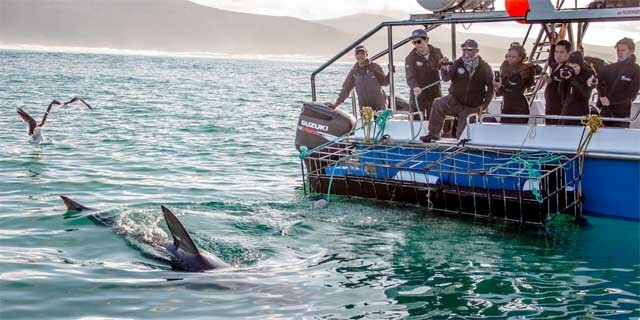 The floats are well positioned in the cage to allow for clear viewing of the sharks. 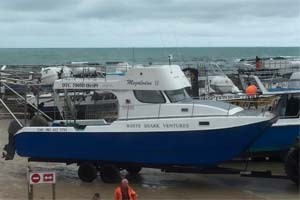 The boat, cage and diving equipment are inspected and surveyed on an ongoing basis. 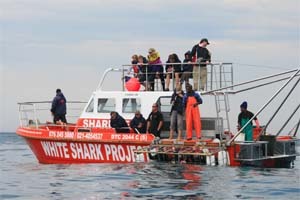 The shark cage diving takes place in two places depending on season. In the winter out at Dyer Island and in the summer just off the beach near Kleinbaai. 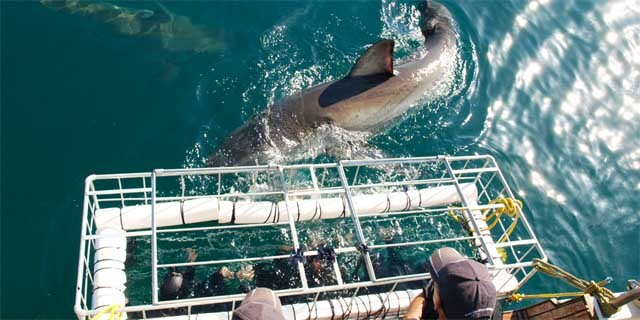 The months of May through October (our winter) are considered to be the best time for white shark diving, although Great White Sharks are seen throughout the year! During our winter season the sharks are at the Island patrolling Shark Alley and Geyser rock which hosts a 60,000 strong Cape Fur Seal colony. 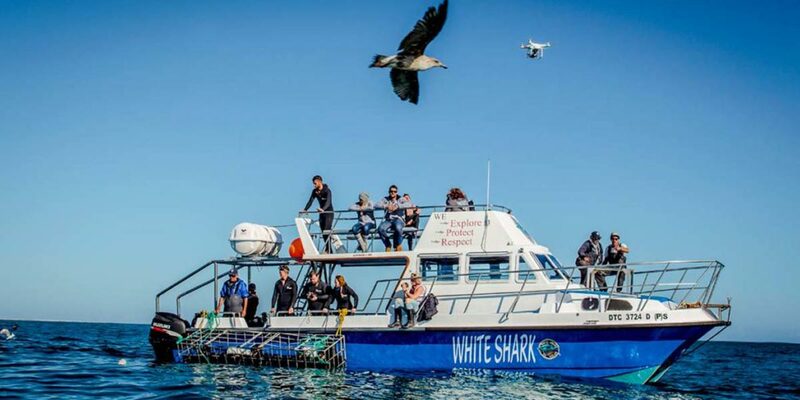 The Great White Shark is a surface feeder and thus all the activity takes place on or very close to the surface, due to this, the surface viewing from the boat is excellent. You do not need any diving certification to do the cage dive. For the first dive you stay in the cage for about 20-30 minutes and then once everyone has been through the cage you can go back in the cage again and again until you have had enough. The cage holds 6 people and so there is plenty of time to cage dive. 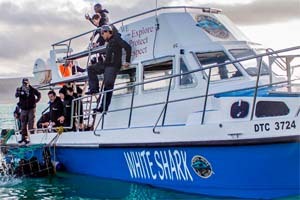 You are guaranteed at least 2-3 dives, depending on the shark activity and the conditions on the day.